The perfect cuddly companion for little ones. Special loop safely keeps JollyPop near and easy for baby to reach. Transitions to hold teethers too! Even when weened from paci, baby still has cuddly friend! Easy to clean in washing machine. 9.5 inches (24.13cm). Click for mini size My First BinkiBear for newborns (40% smaller). 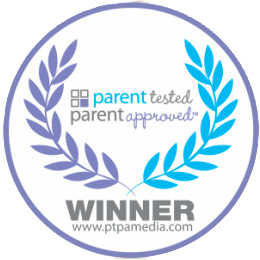 Awarded the winner's Seal of Approval from Parent Tested, Parent Approved (PTPA) Media, North America’s largest volunteer parent testing community, with over 60,000 parents. The PTPA Winner’s Seal is evidence of a products excellence from having been evaluated by unbiased parent testers; assuring BinkiBear's quality, function, and value! Your little one will love BinkiBear. The perfect cuddly companion with a special loop that safely keeps JollyPop pacifier near and easy to find. Mom's love that! Plush BinkiBear makes it easy for baby to find, grasp and manipulate the pacifier. Easy to use with any pacifier - without adapters! TO CLEAN: Wash regularly in hot water with mild detergent; rinse before use. Safe methods to sanitize: Place in boiling water for two minutes. Let cool before use. Place in top rack of home dishwasher or home sterilizer. WARNING: Do not tie pacifier around baby's neck as it presents a danger of strangulation. Inspect carefully before each use, especially when child has teeth. Pull pacifier in all directions. Throw away at first signs of damage or weakness. WARRANTY: JollyPops are guaranteed for 90 days from date of purchase under normal and intended use for service against defective workmanship and material. If our product fails to meet our limited warranty during the 90 day warranty period, we will, at our option, replace the product free of charge, or issue a refund for the value of the purchase price. Plush and easy for baby to find, grasp and manipulate. Easy to use with pacifiers and teethers! Teethe, Soothe, Play & More > Twins & Multiples Savings!